The dB Blocker™ Classic Vented offers the greatest protection where communication is required. It is custom fit to the individual wearer for maximum comfort using Skinsoft™ medical silicone. It is particularly suited for industrial applications where communication between individuals is necessary. dB Blocker™ Classic is a hearing protector that is actually comfortable to wear. Most hearing damage arises when an ear plug is removed for conversation and comfort. Classic dB Blockers™ are made to fit the individual’s ear exactly and stay in place without applying pressure to the ear, so comfort is not an issue. This gives the worker a product that provides effective hearing protection and stays in the ear all day long. 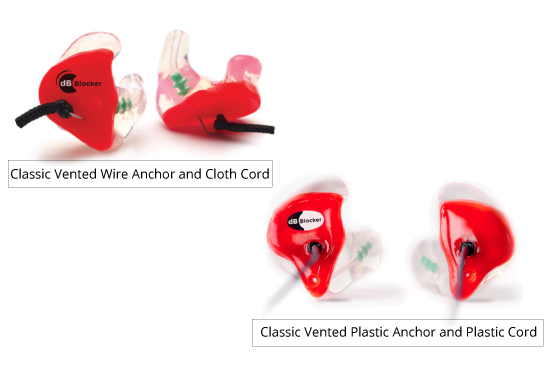 dB Blocker™ Classic Vented hearing protectors (earplugs) contain a proprietary frequency-tuned filter that enhances interpersonal communication. In fact, people can communicate in noise better while wearing their dB Blockers™ than if they were to remove them. They can also be integrated with radio communication devices. The filtered vent allowing the wearer to discriminate between speech and background noise, allowing the listener to hear more clearly in noise.